being woven into a crown. The crown of thorns was placed on the Son of God. which the thorns thought was very odd. The thorns heard crying, laughing and jeering. They even heard some people cheering. They wondered what the other thorns were thinking. While their own hearts were sinking. 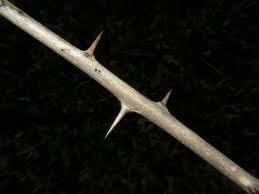 And today these thorns were sad, to be considered the worst. A man came out of the crowd, he took the tree from the man wearing the thorny crown. He helped him carry the tree right through town. The price they would soon understand was going to be paid. While soldiers stood all around. One soldier picked up a hammer and three large nails. The soldiers held His feet together, and drove in a nail to hold His feet to the tree. The other two nails were driven into each hand, now all nails were used, one, two and three. The thorns noticed a sign above His head. In three languages it was read. The words said He was a King. The thorns were confused, He wasn’t wearing a robe, not even a ring. While on-lookers gathered all around. The thorns noticed a man hanging on a tree on either side. Their sins they could not hide. “Lord, remember me when thou comest into thy kingdom,” one did say. They noticed the sky was now black and no longer blue. Inside their hearts they started to cry. They tried to insert themselves deeper into the holes to keep the blood from flowing. But still the Saviour’s soul soon would be going. They came to the conclusion that with God in control their hearts would no longer ache. to be with His Father, the Heavenly Host. The thorns had realized that His blood was in God’s Plan for you and me.